Since I had about 45 minutes until the next Sausalito ferry departed at the Ferry Building, I decided to find the Clipper card customer service locations that recently opened up at the Embarcadero station and Bay Crossings booth inside the Ferry Building. I thought this would be an easy find, but it wasn't. Looking around the mezzanine level of the Embarcadero station shows no signage of where it is located and everything was not open for business (it was a Saturday). I wasn't sure if the new location was at the 511 kiosk near the east BART & Muni gates, the "My Transit Plus" booth, or next door to Peet's coffee. At the Ferry Building, the new location is supposed to be at the Bay Crossings booth. If you are not looking closely, you might not notice the specific location can even provide the more advanced services than what Walgreens or a self-service machine can provide. But something just doesn't feel right about this. I was under the assumption these new locations would have some obvious signage telling people about what services they can provide and have their own dedicated booth/service locations at Ferry Terminal and Embarcadero Station. Instead, it's more like hide and seek. Embarcadero's is hard to identify with zero signage pointing the where it is and it's unknown what their operating hours are. Bay Crossings is more like a "super" retailer where Clipper contracts to them to provide the additional services than just issuing adult cards and adding value. They use their chalkboards to tell people about it, but it's still hidden away between all the magazines, newspapers, and other goodies they sell. I wasn't even sure if the lady behind the counter was even trained to handle this. Lastly, these locations are not even on Clipper's retailers map. I challenge Clipper and the MTC to do better. 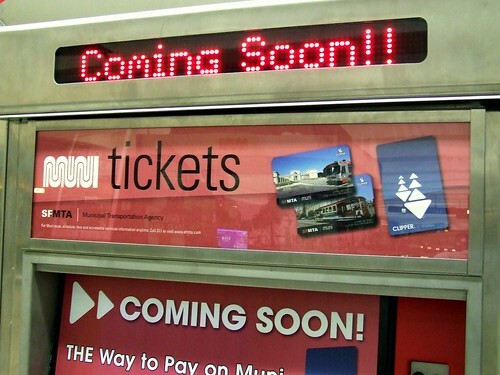 The signage was scheduled to be installed this Wednesday, to coincide with the activation of Clipper on VTA. Since there was such a short timeframe (approximately one week) between the opening of the walk-up centers and VTA's launch, we decided it was more efficient to wait the week to install versus producing and installing a new set of signs in one week. The signs will very clearly and visibly identify these two locations as "Clipper Customer Service Centers." We are also working with the appropriate staff at MTC to develop direction signage for the Embarcadero station. This will take more time, but is something we're working on.